Northwest New Jersey is on the edge of the Hudson Valley's 31 wineries. And it is now an exciting wine region in New Jersey. Not far from Warwick Valley and several other Hudson Valley wineries, Westfall Winery, Ventimiglia Vineyard, and Cava Winery & Vineyard form a small trail all by themselves. Try Ventimiglia's Syrah. Wonderful. Westfall's Pinot Grigio. And Cava Rosso Rame. A great little three winery jaunt. In 2006, Loren and Georgene opened a second winery named Island Winery in Hilton Head, South Carolina, their favorite place to spend cold winters. Currently, they spend their time between the two wineries and invite you to come visit Island Winery if you ever find yourself in beautiful Hilton Head. “The hand-crafted wine making of Ventimiglia Vineyard continues a family tradition passed down for generations. Our wines are made in small batches with carefully selected, top quality grapes. We use oak barrels and minimal chemical or mechanical intervention. Artful blending promotes optimal flavors, aroma, and finish. Our aim is to let you enjoy the delicious wine we share at our own table. “Our aim is to let you enjoy the delicious wine we share at our own table. "Our founder and devoted winemaker, Gene Ventimiglia, was influenced at a young age by the European winemaking traditions which his grandfather, Eugenio Ventimiglia, brought to this country at the turn of the last century. For over thirty years, Gene has been making delicious wines to enjoy at home with his family and friends. Our dream to share our high quality, hand crafted wine has finally come true. 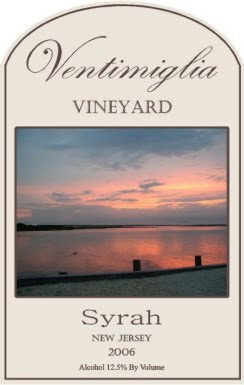 In August 2006, with Federal Permit and New Jersey Winery license in hand, Gene and his wife, Anne, along with their family and good friends, began professional winemaking at Ventimiglia Vineyard in Wantage, New Jersey. 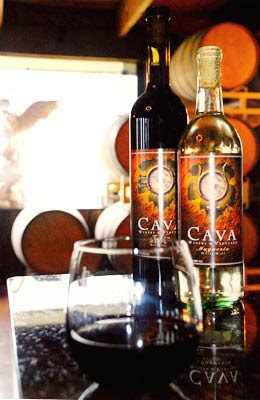 "Situated in the beautiful Skylands of northwest New Jersey, Cava Winery & Vineyard is a story of a family journey. Our path, in simple terms, is respecting the old ways but creating something new and maintaining connectedness. After tracing our family lineage back to Italy and finding our name on the side of a bottle, a dream evolved into reality. "Our location is perfect in many ways. With a history of agriculture that is rooted deep within the lands, our soil’s mineral content is ideal for growing grapes. The terroir drains thoroughly allowing the vines to suffer and the orientation of the sun with east-to-west exposure help our grapes take their natural path in the vinification process. "Making wine is our passion. Along with the drive to connect with our heritage, we are creating wines we proudly call our own. So in New Jersey, a place where Italian-American culture has had a strong presence for many years, we present a winery with a vision to tie the old world to the new.